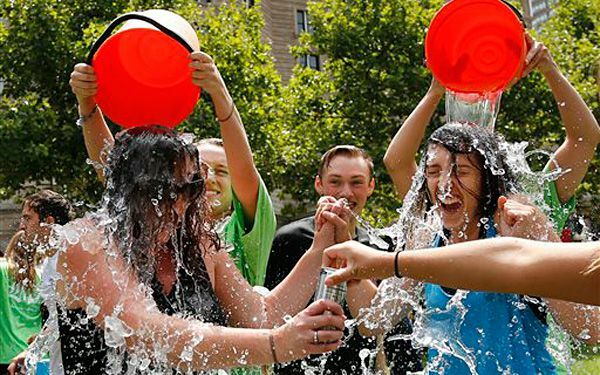 The Ice bucket is a great way to raise money for those who have Lou Gehrig's Disease. It is also a great way to show the awareness of this disease. If you look at it, it isn't really that crazy, it would be a great way to beat the heat and raise money as well. I would do it if I could. This really is a good cause.Like it says it is fun and willingly good.I like the fact that we do this not just for the sake and fun of us, but for organizations for charities to help the peple that need it.I dont really like how it spreads there are people that always get chose and get tired of it but that is just them. I think its cool that people are doing this. I'm lucky i dont have any friends because i dont feel like throwing ice water on my head. But it is for a good cause though and its so kewl everyones doing it. It pretty much became a trend because of YouTubers. I just might do it because i'm not gonna get nominated so ill just do it for fun and not yell at people for nominating me. to give money to charity.Its fun to do and you get to pour water on yourself for a good uses.if u do you will have to pay. I would do this for people who are dealing with ALS I have been picked by friend to this.. This for a grate cause. I think that it is fun and that you do it for a cure makes it even more fun. That is super cool how they did that. I think it is because its a challenge and people like to do that stuff. also people want to raise awareness and the way that they can would be doing something crazy and getting other people to do it. The other opinion would be to donate money and some people do both but others just want to get the word out by doing something crazy and nominating others to do it as well. I think crazy stunts like this motivate people because they want to have fun contributing to charities and not just by giving the charities money. It motivate them because it cathches their attention and it also passes on . Its actually kinda fun to do and it aslo gets a lot of money for the people that needs it . I tink its a great way to raise money over social media .